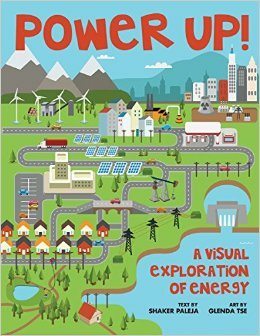 In his second book for young readers, Vancouver actor and author Shaker N. Paleja investigates energy: its formation, history, sources, production, and the many ways in which it’s used. The advantages and costs of fossil fuels – including oil, natural gas, and coal – are covered in depth, with solar and wind power presented as viable alternatives. This highly visual book opens with the cross-section of a house and clusters of smaller images on a sky-blue background, set off by headings and annotations. The pages that follow present 3-D diorama-style depictions of energy production. Small icons ground headings and lists with striking visual markers. The artwork and attractive design is the handiwork of Oakville, Ontario, illustrator Glenda Tse, whose colourful charts, pictographs, maps, and timelines present complex concepts in easy-to-grasp formats. Although the clean-lined art depicts processes like surface mining as amazingly pristine, the book doesn’t promote a sanitized view of energy. Structured in four parts, the content develops logically, beginning with a solid introduction before moving on to discuss renewable and non-renewable sources, and, finally, the future of energy. Paleja ably presents statistics and facts (including that in 2010, U.S. vehicles travelled “the equivalent of going to the sun and back 16,000 times”) that will educate and inspire kids to conserve energy. This material, however, is not always as straightforward as it appears. For instance, in a list about generating electricity from wind power, the U.S. comes out way ahead. This metric obscures the fact that smaller countries like Denmark produce a much greater percentage of their energy from wind, and are looked upon as leaders. Challenging vocabulary may puzzle some readers and scientific terms (e.g., “medical isotopes”) are not always explained. In general, however, Paleja and Tse distill complex information effectively and succinctly. Those who wish to dig deeper can consult the detailed index and superb source list. Power Up! is an informative and important resource with excellent classroom potential.